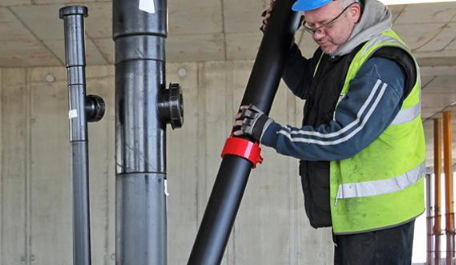 At Polypipe we have soil & waste pipe systems and vent systems to suit all applications. Our extensive range of products designed for commercial building services can drain internal and external fluids from inside any commercial, public, or tall high-rise building to the underground drainage system. Terrain drainage systems are suitable for drainage in tall high-rise buildings, large commercial and public building projects. Our pre-assembled soil stacks are avialble from the Terrain Fabrication Service providing clients with a bespoke system to meet the project's exacting standards. Manufactured from high density polyethylene, this soil and waste pipe system is suitable for a large number of commercial applications. HDPE is a versatile material and due to its inherent characteristics lends itself to fabrication. PVC is an established drainage system material with a long service life in excess of 50 years. Terrain PVC Soil & Waste also lends itself to fabrication. In our noise reducing drainage system we use polypropylene in conjunction with a mineral additive. As well as excellent noise reducing characteristics, it’s highly chemical resistant and has a high temperature profile. Due to its inherent characteristics, polypropylene lends itself to fabrication.